Tonight, as I had hoped to relax and go to bed, I decided to check out the Oregonian's opinion page. When I read Keep School Reform Moving by the editorial board, I felt outraged as a public citizen whose voice they were encouraging to ignore. Isn't this America? Isn't this the land that values free speech and democracy? Well, then what was going on here? What's with the push for education reform at the expense of the democratic process? Recently, the state has been holding public input meetings around the state. Most in attendance have voiced serious concerns about the waiver and ed reform plan put out by the OEIB and the Governor. It seems like those who want all this corporate ed reform stuff to succeed recognize that it may be slipping from their control. They are hearing rumblings of the public who don't want to be sold a faulty bill of goods. They are realizing that the public is starting to see that the Emperor has no clothes, and they know they need to move fast or all is lost. The following is a letter to the editor that I wrote in response to "Keep School Reform Moving." 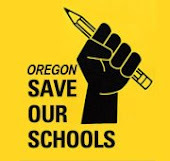 Wow, after reading "Keep School Reform Moving" where the editorial board wants to quickly push through the Governor's and OEIB's education reform plan, it is obvious that the editors of the Oregonian seem very afraid. What are they afraid of? They are afraid of the public voice. Afraid of a voice that asks questions and holds their leaders accountable. Afraid of a voice that stands up for their rights---and the rights of their children. Afraid of a voice that wants their schools to be kept public rather than privatized. Afraid of a voice that respects and values its teachers and their union rather than wanting to bully and control them. Afraid of a voice that demands a well-rounded curriculum rather than constant high-stakes testing and narrowing of curriculum. Afraid of a voice that demands funding of a quality education rather than doing more with less. Afraid of a voice that recognizes that poverty has a huge impact on a student's educational success rather than ignoring poverty. Afraid of a voice that demands smaller class sizes rather than large class sizes. Afraid of a voice that demands to know costs rather than hoping it will all work out with much thought to details. Afraid of a voice that respects and values local control rather than state control in education. Afraid of a voice that wants all schools to be equitable and respected rather than labeled as winners and losers. Afraid of a voice that values collaboration, not competition. Afraid of a voice that trusts its teachers to evaluate and assess their students' performance and success rather than testing and using excessive amounts of data collection. Afraid of a voice that values checks and balances rather than unilateral decision making. Afraid of a voice that demands public input rather than ignoring it. This plan may go forward, but it will be a failure without parent, teacher, and student approval. At recent state public input meetings about this plan, the public spoke loudly and clearly: they are very wary of this plan for the above reasons. Go ahead: ignore the public voice that stands up for what is right. In doing so, this voice will only grow stronger to a point that it can no longer be ignored. The next OEIB/NCLB waiver input meetings will be held on Monday, Jan. 30th in Pendleton, and on Tuesday, Jan. 31st at the PCC Rock Creek Campus. This will be another great opportunity for the public voice to be heard. Hope to see you there. Here is a sneak peak of the film we are showing this Saturday at Macy's Downtown Portland, 4th Floor, Large Classroom from 2-4 pm. This is a great opportunity to learn the basics about the corporate education movement through the eyes of parents, teachers, and students of New York City. As the reform movement spreads West to Oregon, it is important to learn what the warning signs, verbiage, patterns, and key players are. Here is an article about the making of the film and the message it hopes to share. Who knew date night's movie Moneyball would actually spark a conversation about education reform and the OEIB?NCLB waiver? How is this possible you might ask? Well, when the couple are both teachers, it explains a lot. As the doors of our car closed shut last night on the way home from our movie, my husband said, "I was just reflecting about that movie..."
"Well, it reminds me of teaching and how education reformers and those relying on data to game the system of education are really playing their own version of Moneyball." "I KNOW! I was thinking the exact same thing." I replied. He said, "If they think baseball is hard to pin down to computerized stats and evaluation, try teaching. There are so many variables in teaching: kids not doing homework due to a crazy home life, lack of drive, or interest; kids feeling over tested, narrowed curriculum, kids worrying about their next meal, kids dealing with being homeless, kids who are at a 10 year deficit in reading skills because no one really read to them when they were young, large classes, loss of programs that students value, lack of sleep, lack of support at home, peer pressure, busy families trying to work several jobs to survive, and other problems associated to poverty. How can we really pin down numbers and data to determine and predict success?" However, when you look at the OEIB and the NCLB waiver plan, it is increasingly about implementing and collecting data ad nauseum thinking that the more data you try to get your head around the more likely that we can determine the magic answer in getting our kids to succeed. But teaching, successful teaching, doesn't operate in those parameters. Teaching is more like the baseball scouts who use their intuition, experience and knowledge of the game and players to create a successful team. That is what is missing in the education reform version of Moneyball: the voices of the experts who know and understand the game of teaching. Until the voices of those who are in the trenches: parents, teachers, and students are heard and valued, Oregon's education system will continue to rack up more losses than wins in the game of Moneyball. I am the mother of a bright and talented 12 year old who has thrived in our neighborhood Portland Public Schools. As her mother, I believe it is my duty to make sure she has access to the best public education possible. Thus, it is with great frustration that I see our state not only preparing for another round of budget cuts, but on top of it rushing pell mell to burden our public schools with another layer of unfunded and unproven state mandates and bureaucracy. As the Oregon Education Investment Board attempts to railroad the public and the Legislature into institutionalizing their vaguely defined bureaucratic pipe dream of "Achievement Compacts" and "outcome-based budgeting" for Oregon pre-schoolers through college graduates, I find a glimmer of hope in a speech Rep. Lew Frederick recently made in honor of Dr. Martin Luther King Jr. It's a great speech. Please read the whole speech and share it with your family, friends and colleagues. Thank you Rep. Frederick for speaking truth to power - I hope more state legislators AND Governor Kitzhaber will stand with you on behalf of Oregon's children and the future of our great state. This article in the Oregonian, "Invest in Kids, Not Test Scores" got me through a really tough morning. I had stayed up until 2 am grading papers and entering semester grades so that my students would be able to know exactly what work they were missing. It was a bit depressing as some students just failed to turn anything in. Under the proposed OEIB model that values high-stakes testing, it would seem that my future evaluation as a highly effective teacher would be tied to my students' efforts. What is ironic is that I work hard all the time to do my best, and that includes using personal time to make it work. Yet, if work isn't turned in, my job could be on the line. Poverty plays a huge role in why my students don't turn in their work on time or at all, many don't read independently at home, they are expected to take care of their siblings as both parents work, and they are hungry, tired, parents aren't literate themselves and can't help with homework, and often have stressful home lives. What is missing from the OEIB NCLB waiver proposal and Learnworks Plan is any truly practical and useful investment in our kids that helps remediate the effects of poverty. So, why hold me accountable when the odds are stacked against me and the students? Instead we should be holding the state accountable for not providing the necessary stable and adequate funding to schools and wrap-around services that are proven to help all students, especially students of poverty. “Poverty often deprives a man of all spirit and virtue; it is hard for an empty bag to stand upright."